MOST ESTABLISHMENT politicians spend years ignoring working people, going against our wishes. But every few years it seems we're 'the boss' and they want to 'have a conversation' with us. It must be election time. In Lewisham the Socialist Party's election campaign is not about empty promises or vacuous gimmicks. 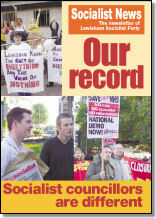 We stand on the record of Ian Page and Chris Flood as Socialist Party councillors. In the council they are the only people who have fought and will consistently fight, hopefully alongside a third Socialist councillor Jess Leech, to defend jobs and services in the borough. All the main parties are preparing huge cuts after the election. In Lewisham alone, the Labour group's budget proposal includes the prospect of cuts of £50-£60 million in the next three years; these cuts will inevitably hit all council departments and go deeper than ever. We have launched an anti-cuts petition in the names of sitting councillors Ian Page and Chris Flood as part of the campaign. 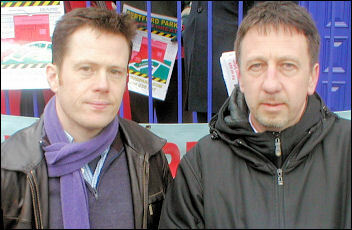 As well as supporting the Trade Unionist and Socialist Coalition (TUSC), the Socialist Party participates in Lewisham People Before Profit, an alliance of anti-cuts, anti-privatisation candidates that is contesting every council and parliamentary seat in the borough and for the directly elected mayor. These two electoral alliances represent a step forward in building a genuine mass alternative to the main parties. It will be a hard fought campaign. A general election means an increased turnout in local elections, where fear of the Tories getting back in nationally may prompt some workers to instinctively vote the Labour ticket in local elections too. But many people we speak to are unsure how to vote and are completely disillusioned with the main parties, especially after the expenses scandal. That is why one of our most important tools is the 'Our Record' pamphlet which details every campaign and motion Ian Page and Chris Flood have supported and shows how they and the other parties have voted on key issues. It sets the Socialist Party apart from the three big business parties and the Greens. We need to speak to as many people in the ward as possible and re-visit them to ensure that everyone is clear of the role that socialist councillors can play. 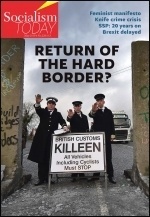 For more info and how to help in the campaign, visit our election blog at http://lewishamsocialistparty.wordpress.com. 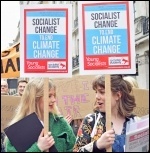 In the other council seats in Lewisham the Socialist Party is fully backing the candidates of the Lewisham People Before Profit coalition, which has brought together different campaigns across the borough in defence of public services.